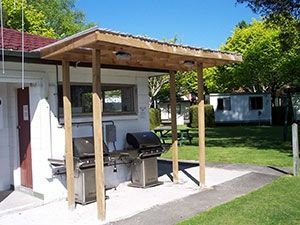 Around the park we have a covered BBQ area which has 2 coin-operated BBQs. There are numerous picnic benches and tables dotted around the grassy areas of the park. We have a laundry room with 3 Maytag commercial coin-operated washing machines, two commercial gas-fired coin-operated tumble-dryers as well as a sink for hand-washing, an iron and ironing board, a large work bench and ample outside line space for natural outdoor drying. 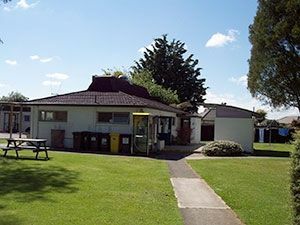 Our laundry room is open from 8am to 9pm daily and also houses a soap powder vending machine and a snack vending machine. We have 2 kitchens on site. The main facility houses a family-sized fridge/freezer, 2 full cookers, 1 gas cooktop and a microwave oven. There are 3 stainless steel sinks for washing up with plenty of bench space. There is ample seating and bench tables. There is also an electric jug, toaster and a ZIP boiler, which is available to large groups on request. The smaller kitchen has a full oven, a microwave oven, a family-sized fridge/freezer, an electric jug and toaster. Utensil boxes are available for hire: $10 with a $40 bond. These have pots, pans, tin opener etc. 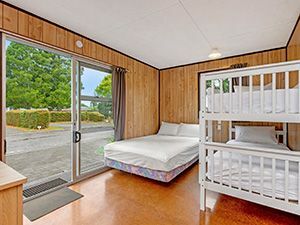 There is a family/wheelchair accessible bathroom which is available for use on request. The hot water for both amenity blocks is provided by gas-fired on-demand 'infinity' type boilers, so there is always plenty of hot water. No need to get up at the crack of dawn to get a hot shower! Our showers and toilets are well-maintained and clean and feature automatic lighting. 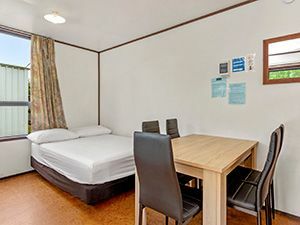 We have WiFi internet access on site, hosted by Zenbu, available within sight of the office 24 hours a day. Currently $5 allows you to transfer/receive 500MB of data. Tokens can be bought in the office or online via a credit card.